The VG245H is pitched at gamers, but it sits in the entry level end of the spectrum, designed for those who want a great playing experience but don’t feel the need to part with an arm and leg for the privilege. It has a TN panel, generally cheaper than the popular IPS alternative. 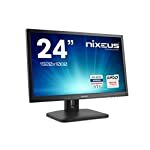 These are good for gamers as they are fast and responsive but tend not to have such a high quality image, especially when viewed side on. It is a standard 1080p HD resolution, which is fine for the 24″ form factor and serious gamers on a budget may not have the fire power to power a QHD screen anyway, let alone 4K which is out of reach for most of us right now. The Asus VG245H has another trick up its sleeve, it can run at 75hz. This might not sound like a big jump on 60hz when other monitors are boasting 144hz but actually there are big gains in experience to be had as you go over the standard 60 frames per second and this effect tails off as you get to 144 and beyond. My first gaming monitor ran at 75hz and I certainly noticed it, I always felt it made a difference in my competitive Unreal Tournament gaming days. So it might not be able to trump other gaming monitors on this stat but don’t discount it. You also get FreeSync thrown in which makes this a very attractive deal at this price point. In fact there’s not much more you can hope to squeeze in. We have to recommend it! The VG245H is a solid looking attractive monitor that borrow heavily from the ROG range of Asus monitors. It has a matt black finish with a touch of blue colouring which adds to the finish. I’m not convinced that the brash red gaming stripes add to the appeal of monitors but the touch of colour here seems to work. The chisel like stand looks good and provides stability with a small footprint. It features a complete range of movements so you can raise it, tilt it, swivel it and even rotate it by 90 degrees when the call to do so arises. Setting up the screen to be directly in line with your vision is critical with a TN panel as image quality deteriorates dramatically when viewed at obscure angles. All in all the Asus VG245H holds up very well given its price point. Sound is handled by a headphone jack and internal speakers. As always, if you want premium quality sound you’ll want to hook up your headphones or a hifi. Connectivity is handled by two HDMI ports and a legacy VGA socket, so you can have this hooked up to a PC and console if you wish. Gamers might be pleased to learn this model features the Asus GamePlus mode which provides crosshair, timer, FPS counter, and alignment. Not something that would excite me but it’s there if you want it! Professional testers report back that the panel performance is good for a TN screen. As always, if you are looking for the best image quality you may wish to look at an IPS based display but home users will have no problems. It comes with a range of presets that will help you get the setup that works for you, else there are calibration guides available on line. 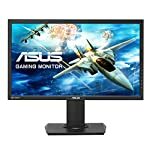 Asus claim that this monitor provides a low lag experiences, and looking through the professional reviews it seems that this an accurate description. Whilst it doesn’t come in lower than other gaming monitors it performs well, another tick in the box for those looking for a solid game ready monitor. Another big draw for this model is the inclusion of FreeSync. This ensures that your monitor is synchronised to your graphics card and display frames as fast as your GPU can generate them giving you a smooth tear free low lag experience. Unlike its main rival G-Sync, FreeSync only operates within a limited range. In this case the system only works when your PC is generating between 40 and 75 frames per second. On the plus side, it is cheaper! Some blurring is perceivable even though this has a 1ms GTG response time. Playing with the Trace Free configuration option can reduce this though. I can’t comment directly as I have not had a hands on with this model yet. We give the Asus VG245H a 4.5 out of 5 rating. Want to know what existing owners of the monitor think? You can read real user reviews here. Should I buy the Asus VG245H ? The Asus VG245H is a strong contender for gamers looking for a well priced monitor that balances performance with cost. The design is solid, the 75hz refresh coupled with low lag makes this very attractive to gamers. And the inclusion of FreeSync will be beneficial to AMD graphics card owners. This monitor is not a premium bit of kit but what you get for the money makes it very interesting indeed. If you are having some doubts about this purchase then why not read some real owner reviews and see what other buyers think. Welcome to the Asus VG245H FAQ. This section attempts to answer common questions you may have, please get in touch if you have any more queries or if you think our answers need updating. 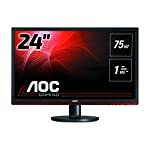 Will the VG245H work with my G-Sync card? Yes, you can run it and it will still run well. But, you won’t be able to use the FreeSync options. You might want to consider a G-Sync monitor instead but these do cost more money. 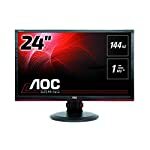 How do you configure the monitor? There is a joystick that can be used to control the on screen display (OSD). From here you can setup GameVisual and GamePlus, set timers, FPS counter and select game modes . You can also carry out additional display calibration to get the best image possible.